SDB | S&P Canada Ventilation Products, Inc. Exhaust air up to 31,563 CFM in high static pressure applications up to 1-3/4" w.g. The SDB belt drive fans are designed to exhaust air up to 31,563 CFM in high static pressure applications up to 1-3/4". The aluminum exterior provides an attractive appearance. Belt drive results in lower operating RPM and sound levels, making the Model SDB well suited to applications where quiet operation is important. Belt drive also permits easy performance adjustments when needed to balance the total ventilation system. The non-overloading backward inclined wheel with its higher static pressure capability makes this unit suitable for either ducted or non-ducted applications. Its roof mounting permits location near the area to be ventilated, allowing short duct runs and more efficient operation. 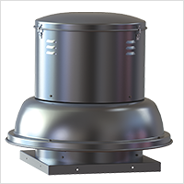 SDBs are primarily used for the exhaust of relatively clean air from a wide range of commercial, industrial and institutional environments such as manufacturing and assembly plants, office buildings, schools, hospitals, restaurants, athletic facilities and many others.